This work starts from two improvisation sessions recorded in the first part of 2009 and then edited on the computer in spring 2010. 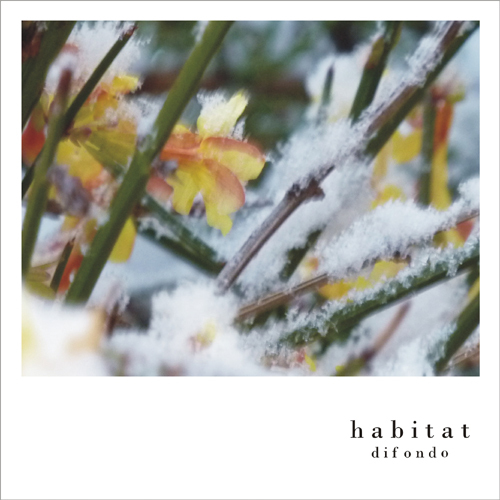 Using the metaphor of “habitat” to give the title to this album comes from the desire to imagine the sound space as a dimension in which the musical processes are ideally considered at the same strength of the typical developing and connection processes (occuring) in nature. For this reason every piece has to be seen as closed in itself, as a specific habitat, but at same time contributing, as a jigsaw part, to create an immersive listening dimension. In a wider sense the term “habitat” refers to a music vision which John Cage would define “ecological” in his ideal effort to consider all the aspects of the sound field as belonging to nature without genre distinction or, may be better, as “a whole game of his elements”. The emphasis given to the term “habitat” takes us to dedicate this work to the celebrations linked with the ONU’s choice of declaring 2010 as the “Year of the Biodiversity”. This as an ideal support to the reflection on human life considered in its essential relationship with the environment surrounding us, our habitat indeed.